Explore the canal at your own pace aboard our self-drive hire boat Leamington which can carry up to 12 people including the skipper. It has a small enclosed cabin, open foredeck, toilet and sink. However there are no cooking facilities and it is unheated. All self-drive hires are from the canal basin. One member of your party must be nominated as the skipper and the Leamington – Information for Hirers guidance should be studied by the hirer and skipper before leaving since it describes possible options for your trip. At the start, a LUCS volunteer will provide training which can take up to 30 minutes. This time is not included in the Hire time but starts at the time the hire is booked. Payment is by cash or cheque on the day of the hire – no deposit is required. The LUCS Booking System shows when Leamington is available for hire and enables you to make a booking and to pay on-line by PayPal, credit card or debit card. Alternative payment methods are payment by cheque or by prepaid LUCS Gift Voucher. In these cases the booking will be provisional until confirmed by LUCS. Gift Vouchers: If you are thinking of a novel present for Christmas, a birthday, an anniversary or any other occasion, LUCS can provide gift vouchers for the hire of the self-drive boat, Leamington. 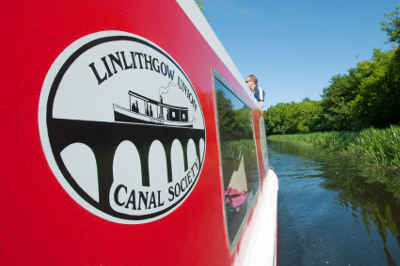 The gift voucher can also be used for the hire of Victoria or St Magdalene with a driver and crew, Town Boat Trips, Aqueduct Cruises and Falkirk Wheel Cruises. To make an enquiry please contact LUCS at – bookings@lucs.org.uk.